Their FA Trophy tie with Ramsbottom has reminded AFC Fylde chairman David Haythornthwaite just how far his club has come as they eye a cup first and promotion to the Football League. Haythornthwaite first became involved at then Kirkham and Wesham FC when his company VetPlus sponsored the team in 2006. Since then he has taken control of a club which has risen from the West Lancashire League to the top four of non-league football. A lot has changed since Fylde were last at Northern Premier League level like Ramsbottom, who they replay at Mill Farm tonight for a place in the last eight of the FA Trophy. Among Haythornthwaite’s targets is to become the first club to win both the FA Vase and Trophy. Speaking about returning to their roots for last Tuesdasy’s 5-5 draw, he said: “It reminded me how tough it is. I mean no disrespect to Ramsbottom but you can see the gulf on and off the pitch. “Coming back home gives us a better chance. It was a mudbath like Newport v Middlesbrough – and look what happened to Middlesbrough. “Our guys did not like the muddy, tight pitch. They are not used to that. I thought we were lucky but sometimes you need a bit of luck. 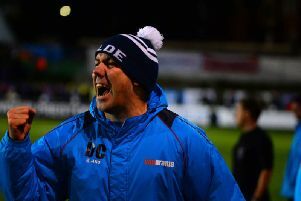 “Win and we have Barnet (or Carshalton, who also replay tonight) at home and the chance of a semi-final. I think we have a really good chance of getting to Wembley this year. “We have always fancied our chances in the Trophy. We have won the Vase and no team has ever won both. “We are also doing better than I thought in the league. When we played Salford at home (and lost 2-0 in September) I thought they were fantastic. I told Gary Neville (Salford co-owner), ‘I think you will win it by 10 points’. “Something is not quite right there and they have had a bad run. Leyton Orient (leaders) have fallen off a bit and we have put together a good run.